Advanced coaxial beam with retro-reflective laser provides the ultimate solution in transparent object detection. 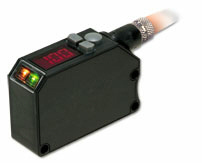 The coaxial beam allows for accurate detection because of the one-axis alignment and laser controlled rectangular projection onto the reflector. The detailed functions and simple operations paired with automatic sensitivity controls make the DR-Q Series one of the best transparent object detection sensors on the market. Purchase your OPTEX DR-Q Series Transparent Object Detection Sensors today!